It has been several years since Tamron introduced the high-speed, full-frame SP AF 28-75mm f/2.8 XR Di LD Aspherical [IF] Macro standard zoom for serious amateurs and professionals. In that time the number and popularity of full-frame DSLRs has increased dramatically, in part owing to the debut of video capture but also due to a number of more accessibly priced camera models. In spite of this, both Canon and Nikon have yet to fully address the need for a high-speed standard zoom offering image stabilization for both stills and video. Of those two Canon is perhaps ahead of the curve. Nikon has the AF-S Nikkor 24-120mm f4G ED VR, but Canon offers three image stabilized primes and two zooms, the EF 24-105mm f/4L IS USM and the brand new EF 24-70mm f4L USM. Priced competitively at $1299, the Tamron SP 24-70mm f/2.8 Di VC USD changes all of that as the first, high-speed standard zoom to offer image stabilization. Like its predecessor, the new lens will also appeal to users of APS-C size cameras. Then the range of focal lengths has an effective field of view as a 36-105mm (or 38-112mm on Canon APS-C bodies) in 35mm terms, while retaining the highly prized image stabilization function. Tamron hasn’t only included stabilization to tempt potential users. It also has an ultrasonic AF motor, weatherproofing and, as a ‘Di’ lens, features advanced anti-reflective coatings and a complex optical design to improve imaging performance with digital sensors. A variant for Sony SLT cameras is also available but as those camera models feature a stabilized sensor, the Alpha mount version lacks the VC function. When mounted on a Canon EOS 5D Mark II, the Tamron SP 24-70mm F2.8 Di VC USD achieves an overall DxOMark Score of 24, the second highest score in our database for a high-speed (f2.8) standard zoom. Although the Tamron has well-controlled chromatic aberration, it’s the excellent transmission values and high sharpness, measured at an average of 15P-Mpix, that really make this lens stand out. On the downside, there’s some noticeable vignetting in the corners at the maximum aperture at 24mm and 70mm. It is slightly lower in the mid-focal lengths but it never really goes away completely when stopped down. It just gets less noticeable. All of the vignetting maps above relate to the maximum aperture at 24mm, 35mm, 50mm and 70mm focal lengths respectively. Another shortcoming is distortion. Zoom lenses like this tend to exhibit barrel distortion at the wide end altering to pincushion at the other. While our figures are lower than average at 0.3% for this type of zoom, the Tamron has, in fact, quite heavy barrel distortion at 24mm. In our first comparison, with an overall DxOMark Score of 24 the Tamron matches the high-regarded $1,900 Nikon AF-S Nikkor 24-70mm f2.8G ED but can’t quite match the category leader, the optically awesome but costly $2,300 Canon EF 24-70mm f2.8L II USM. Looking at the Lens Metrics Scores for Transmission, Distortion, Vignetting and Chromatic Aberration it would seem the Tamron should be ahead, but they don’t tell the whole story. Look at the overall DxOMark Score and the linear scale and gauge behind it. The score is an average result based on the lens performance over the various focal lengths (when tested on a specific camera), and the blue-color gauge shows the range of results. If the gauge is wider, or larger, as it is for both the Tamron and Nikon lenses, it means the performance isn’t consistent at each focal length. Notice the narrow range of results for the Canon lens, it’s a simply a superb performer throughout the zoom range. In the case of the Tamron, and Nikon in this instance, both lenses show a noticeable loss of sharpness in the mid-to-longer focal lengths, and not only in the centre of the frame but also at the edges and corners. Although all three zooms show similar overall Sharpness scores, the Tamron can’t quite compete with the Nikon or Canon across the image field at longer focal lengths. One area where the Tamron surpasses both the formidable Canon and the Nikon lens is in the control of troublesome lateral chromatic aberration. Like the pricier Canon and Nikon zooms, the Tamron has a complex optical formula including multiple low-dispersion (SLD in Tamron parlance) glass elements, three molded aspheric and one-double sided aspheric element but the result is the Tamron has the lowest chromatic aberration of the three. Perhaps not surprisingly, the heaviest effects when visible occur at its widest setting over the f/2.8-8.0 range. Despite taking 82mm filters it’s the most compact at 108.5mm in length but falls between the two in weight at 825g (the Canon is 113mm in length, weighs 805g, and takes similar size filters whereas the Nikkor has a 77mm filter thread measures 133mm front to back and weighs in at 900g). 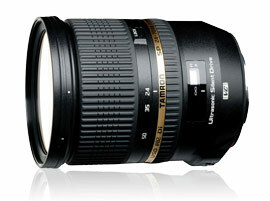 In our final comparison, we’ve pitched the Tamron with the recently announced Canon EF 24-70mm f4L IS USM. Although it has stabilization and an ultrasonic motor it’s more compact at 93mm in length, takes 77mm filters and weighs just 600g. However, it loses a stop of light and retails for $1,499. With low levels of CA, vignetting and distortion the new mid-speed Canon is a good performer optically, but it has some off-axis softness wide-open particularly at 50mm. Our other contender should be no stranger to Tamron, Sigma is largest independent lens maker in Japan and has offered a couple of 24-70mm f2.8 designs. The latest, the 24-70mm f2.8 EX DG IF HSM has the usual exotic mix of glass, standard 0.38m minimum focus distance and has an ultrasonic motor for fast near silent AF and takes 82mm filters, but it lacks any form of image stabilization. However, at 790g it’s the lightest of the f2.8 models and at $899 it’s the most modestly priced. It has very high central sharpness at the wider end at maximum aperture that improves across the frame on stopping down but sharpness drops off quite dramatically at 50mm. It has also has heavier barrel distortion and higher levels of chromatic aberration. The Tamron SP 24-70mm f/2.8 Di VC USD is in the top three best performing high-speed standard zooms currently available. We’ve only looked at the imaging performance, but it’s as impressive optically as the highly regarded Nikon AF-S Nikkor 24-70mm f2.8G ED. At $1,299 it’s not cheap but it is competitively priced – to improve on the image quality you would have to spend $1,000 for the sublime Canon EF 24-70mm f/2.8 II USM. Dropping down in price to the Sigma at $899 may be the way to go on a budget, but that lens lacks weatherproofing and can’t match the Tamron optically at all focal lengths, nor can any one of those rivals offer the highly sought after optical image stabilization. For the time being at least it’s a Tamron exclusive feature in this lens type, and that combined with the comparative image quality makes it difficult to ignore.